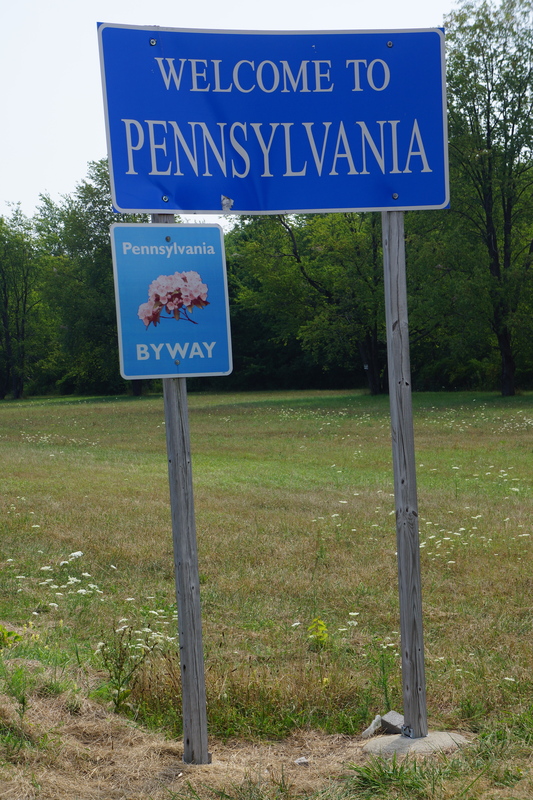 Mile 52: Back home in Pennsylvania after biking 3,200+ miles (although I am 400 miles from home). What a difference a day makes. Once we left the Cleveland area, the roads improved, the scenery improved, and the traffic improved. The only downgrade was the temperature (mid 90s by the end of the ride today). 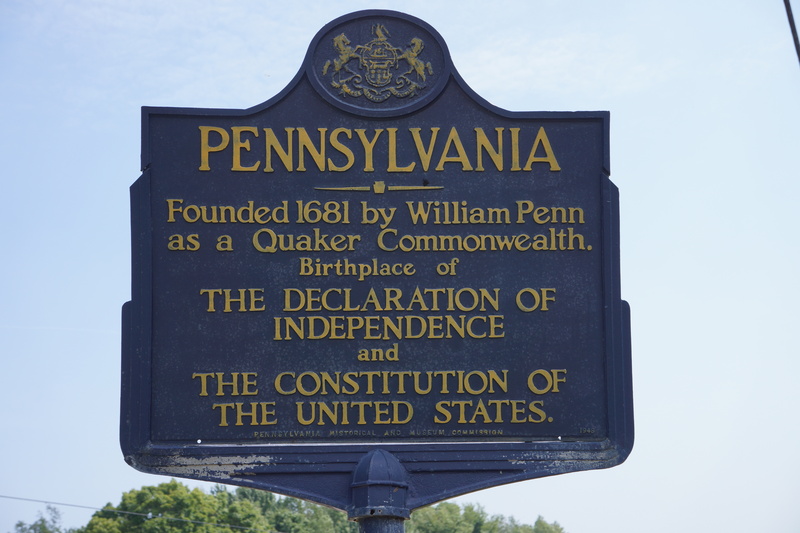 It is hard to believe that I ended the day in my home state of Pennsylvania (400 miles from home). I started biking early to avoid the afternoon heat and biked the entire 80 miles only stopping for water. I didn’t see a person in my group until the Comfort Inn in Erie. It worked out great as I passed a large Trek bike shop a mile before the Comfort Inn and was able to get my bike serviced (new chain and cassettes, and cleaned & oiled) on the spot. I still reached the hotel by 2 pm just as Doug arrived by bike and Dale arrived in the SAG wagon. Since our rooms were not ready, Doug and I researched the best ice cream in town and road our bikes to Sally’s on Presque Isle (see photo below). Unfortunately, I realized after several hours (and trying to take a nap) that the room was not cooling down (it was up to 87 degrees based upon my bike computer) – the air conditioner was not working. The hotel (which was very nice) was sold out and didn’t have another room available, so they replaced the entire air conditioning unit in my room. When I got back from a great dinner at Sarafini’s Italian Restaurant down the road from the Comfort Inn, I found that the replacement air conditioner didn’t work either. Happy ending – while the front desk was working on a solution, I got a call that the hotel had a cancelation and a new room with perfectly working air conditioning was available. I slept very well. Two couples who rode this cross-country tour last year with Diane and Dale joined us for the ride today and shared great stories of their tour last year and other tours they have taken. One couple, Ron & Judy, biked Vietnam with Dale and Diane several years ago and had biked with Classic Adventures to Greece. A positive comment I failed to make yesterday was the beauty of the homes (modest home as well as the estates) we passed on Lake Erie. This was particularly true in the suburbs on either side of Cleveland (even if the roads were great for biking). 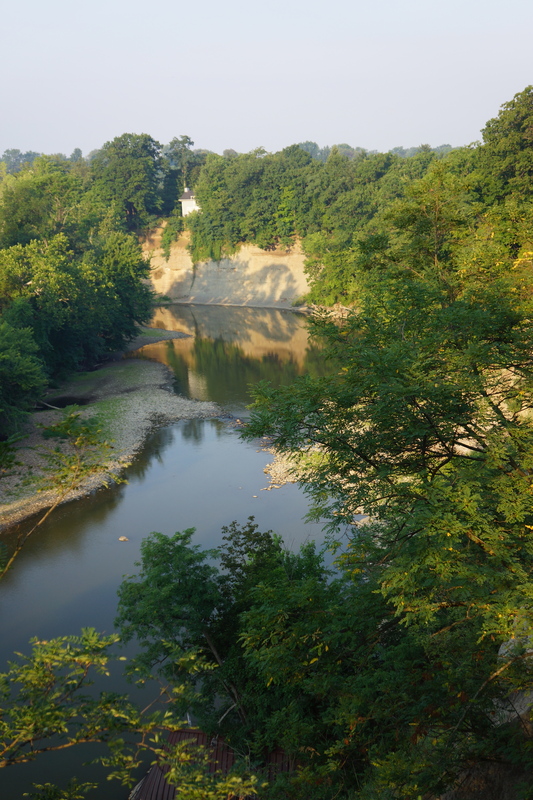 Mile 8: A view of the Grand River near Painesville, OH at 7:30 am. 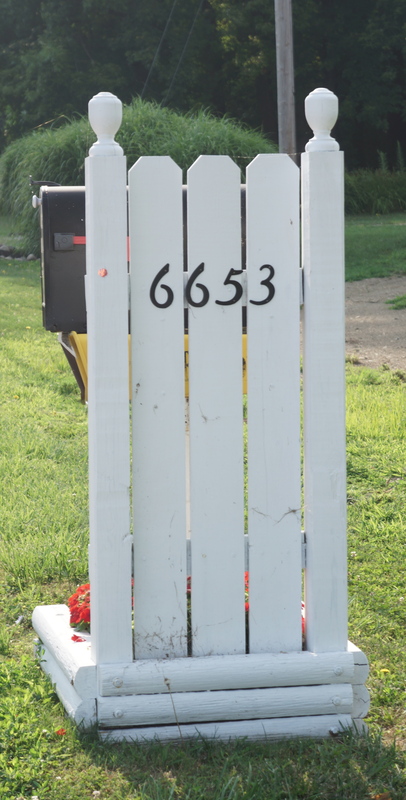 Mile 15: I saw hundreds of these mailbox protectors in Ohio. I don’t recall seeing any until I reached Ohio. They varied from very elaborate and designer protectors to unpainted plywood with no markings. After having to replace my own mailbox twice due to vandals, I will consider one for us if it happens again. Mie 30: A bicycle on display in Geneva-on-the-Lake, OH. 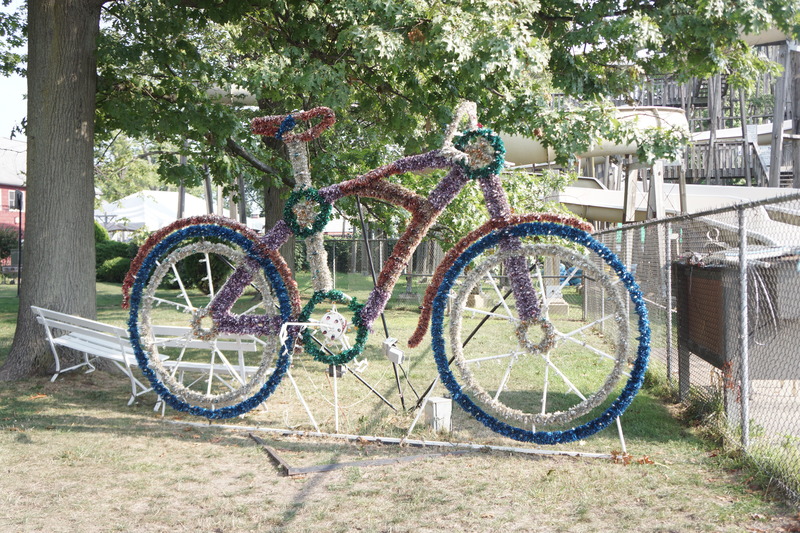 The bike is about 8 feet tall and covered in lights – I would have liked to see it lit at night. 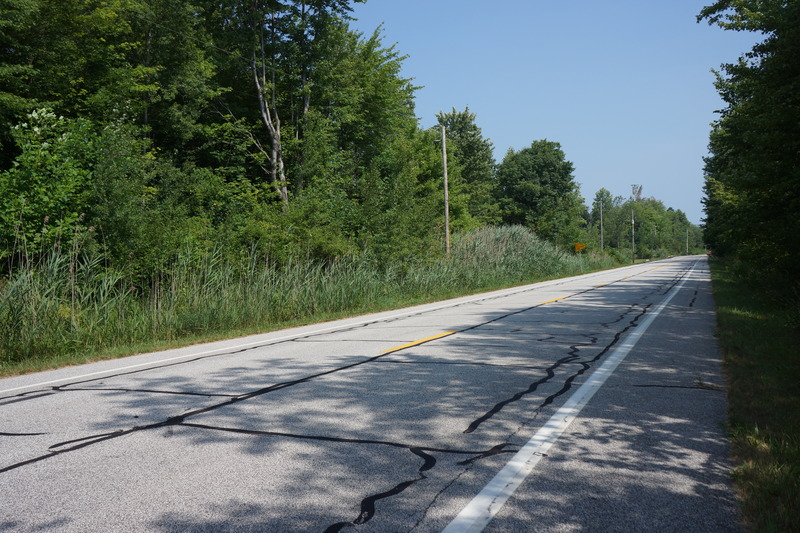 Mile 59: View on Route 5 in Pennsylvania today – Great roads and scenery (the black tar marks on the road were very smooth and the shoulders even better to ride than the road much of the day). 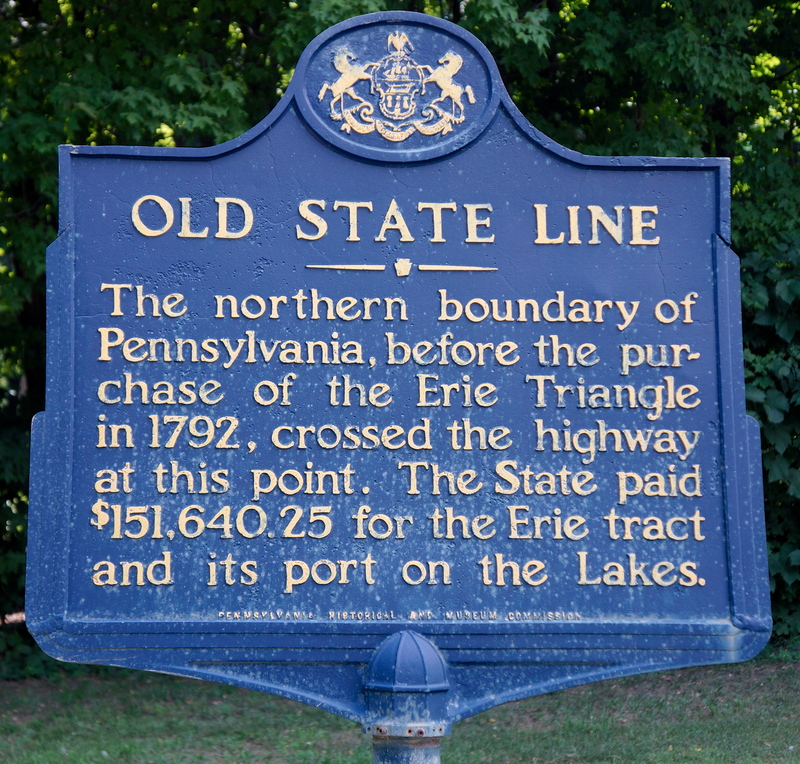 Mile 60: Historical Marker – Pennsylvania State Line. 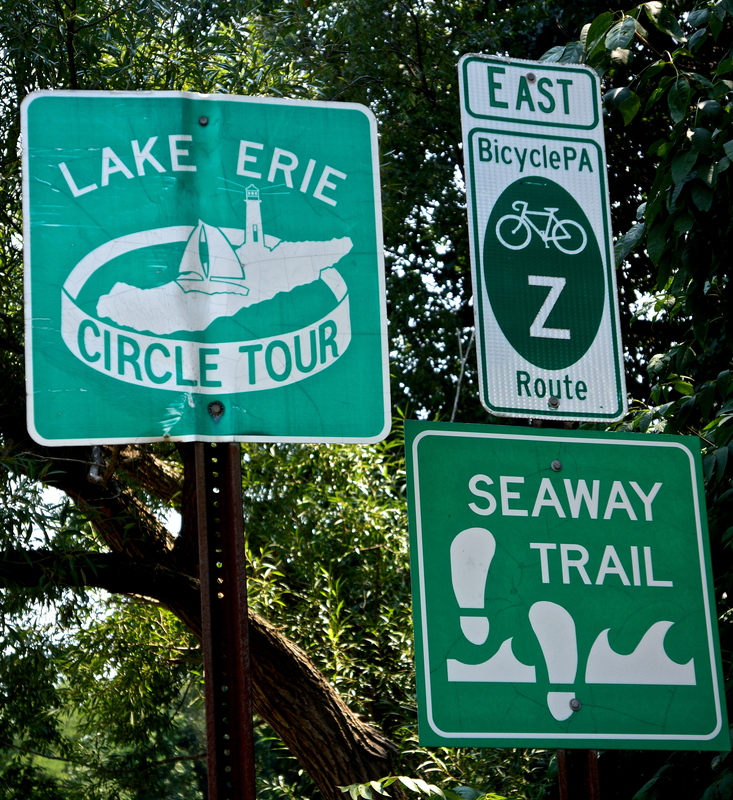 Mile 64: Today’s ride was designated three different ways, 1) Lake Erie Circle Tour, 2) Seaway Trail, and 3) Bicycle PA Route Z.
Sally’s, Presque Isle: Doug and I arrived very early at the Comfort Inn (2 pm) and before the rooms were ready. After consulting the hotel staff on the best ice cream in town we biked a mile to Sally’s – A landmark establishment at the entrance to Presque Isle State Park. It was mobbed with people enjoying the ice cream (like the black raspberry I had). This view only represents a small portion of the entire restaurant that was in two different buildings. 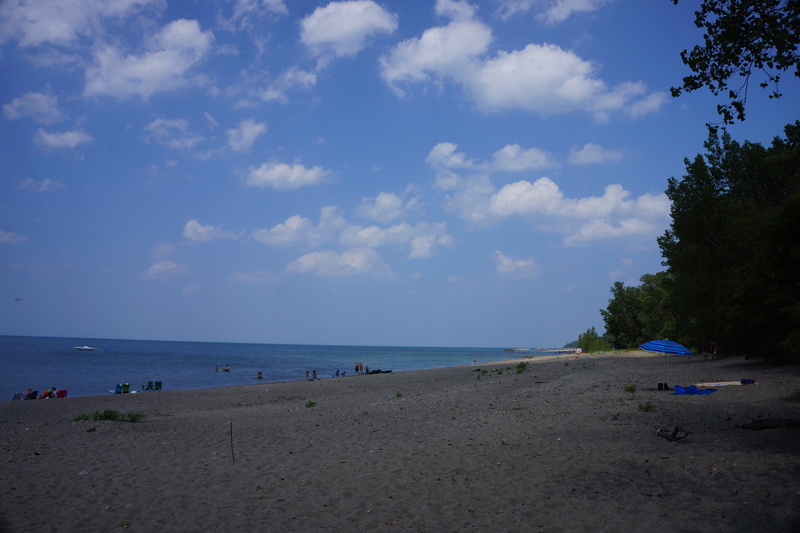 View of Presque Isle State Park Beach. This entry was posted on August 5, 2012 by Steve. It was filed under Photograph of the Day . Steve! I am so glad to read that you are finally in Pennsylvania! Presque isle is beautiful. We drove up there to pick up our collie Anna, so we explored the area. I will tell Anna you were visiting her mother. Good luck as you enjoy the journey through your home state. I am so relieved you survived Cleveland! By the way, did you ever visit the Rock and Roll Hall of Fame?